First things first: you guys? You're the best. Your excitement and support and nuggets of wisdom from when I shared our news were exactly what I needed. Thank you. It's really been a wild ride so far, and I know we've only just begun. I'm toeing a thin line between total, rock-hard pragmatism and instinctive, uncontrollable emotion. One moment, I'm all "why are the randos on the bus touching my belly?" and the next, I'm crying at a J&J commercial. It the pregnancy? Partly. But it's also been a very newsy few weeks for my family and my loved ones, and not all the news is good. Some is worrisome, some is frustrating, some is downright scary. Life suddenly sped up, and I can't seem to slow it down. My due date feels like the first steep drop in a roller-coaster that's just begun its initial climb, and everything along the way -- including life and health events from many others in our lives -- has taken on a similar inevitability. We're drinking life from the fire hose. Summer is also bursting forth at unstoppable speed. Soon, we'll be heading to the market for one last haul of strawberries. I'll be scrambling to macerate and cook and can as many as I can so that when life gets a whole lot busier, at least I'll have some jam. Asparagus are in full bloom, likely only a few weeks from burrowing away until next year. The weather's unmistakably warmer, and the fruits and vegetables and herbs are paying close attention, blooming on command. With such sudden abundance, I catch myself wondering whether it wouldn't be a little better if things could grow slightly less quickly, extending the bountiful season a bit longer, staving off the end. But in truth, the only thing to do is to seize plenty when it manifests, make the best of it that we can, and stow away those feelings of abundance and fullness and sheer luck so that when the seasons turn and the strawberries are gone, we'll remember how good it all was. And maybe we'll even have a bag of strawberries in the freezer or a jar of jam in the pantry that can help extend that taste for a little bit longer. This is a recipe for a fleeting season. It's something to make right now, while strawberries are at their prime and it's not too hot to light the oven. The black pepper is subtle, paired with vanilla and a bit of sugar, but it adds depth to an otherwise very agreeable dessert. The biscuits happened because I'm not a fan of shortcakes, but buttery cakes layered with macerated strawberries and whipped cream is as perfect a combination as they come, and you'd be nuts not to embrace it one way or another. Marion Cunningham's cream biscuits cannot be improved one iota, so that's the template I chose. For the cream, I combined a bit of quark with whipping cream; creme fraiche also works great. You want a thick, slightly tangy cream to compliment the biscuits and strawbs. And about the berries: Use the best ones you can find. If they're bad, ehh. If they're great, they'll sing. The strawberries are red and ripe and sweet: it's time. Macerate the strawberries: In a medium bowl, toss cut strawberries with sugar until fully coated. Set aside while you prepare the biscuits. Make the biscuits: Preheat the oven to 425 degrees and set out an unlined, ungreased baking sheet. In a large bowl, combine flour, salt, baking powder, sugar, and black pepper until fully incorporated. Add 1 cup of cream in a slow drizzle, stirring frequently, until the flour starts to come together. Add vanilla. If many dry bits of flour remain, add up to 1/2 cup additional cream, just until there are no large dry clumps. Turn dough onto a lightly floured surface and knead a few times, until the dough comes together. Pat the dough into a square about 1/2-inch thick. Then cut into 12 small squares. Dip each square into the melted butter so the butter coats all sides; then transfer squares to the unlined baking sheet about 2 inches apart. Bake for about 15 minutes, or until lightly browned. 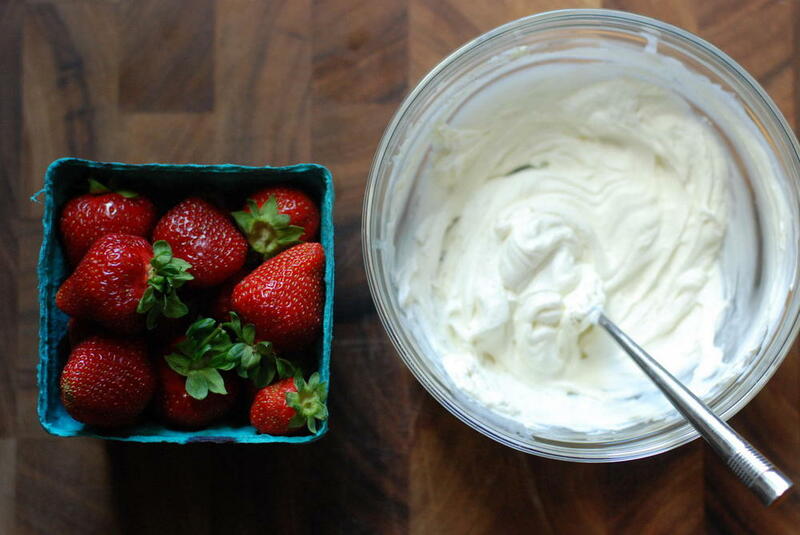 Meanwhile, make the cream: In a very large bowl, combine creme fraiche/quark and 1/4 cup of the cream. Whip with a beater or fork until fully incorporated. Then add the remainder of the cream, the sugar, and the black pepper, and beat by hand (or in a machine) until the mixture forms soft peaks. Because the quark is so thick, I found that this took less than a minute. That said. you can also follow Nancy Silverton's technique of adding the creme fraiche/quark last. That's here. To serve: Slice two biscuits in half and set bottom halves on a plate. Spoon a big dollop of cream on each, and top with a big spoonful of macerated berries on the cream. Top with the top half of the biscuit; eat immediately. Friends, today is the day I almost told you a story about the time I made a recipe I'd had my eye on for forever, and it was a total dud. The recipe came from Elaine Sciolino, by way of the NYT dining section. Sciolino shared it last year, along with the jealousy-inducing tale of her adventures foraging white asparagus in the forests of France. The white asparagus in the pictures that accompany the article look they were pulled from the earth: they're a rustic shade of white, with dull black bottoms. They look like springtime. I don't have easy access to the forests of France, nor my own personal crop of white asparagus. I do, however, have easy access to a grocery store. Determined to finally make this recipe, I went to the nearest Whole Foods and spent too much money on creamy, pale stalks of organic white asparagus from California. Then I headed home, pulled up the recipe, and tried to make magic. 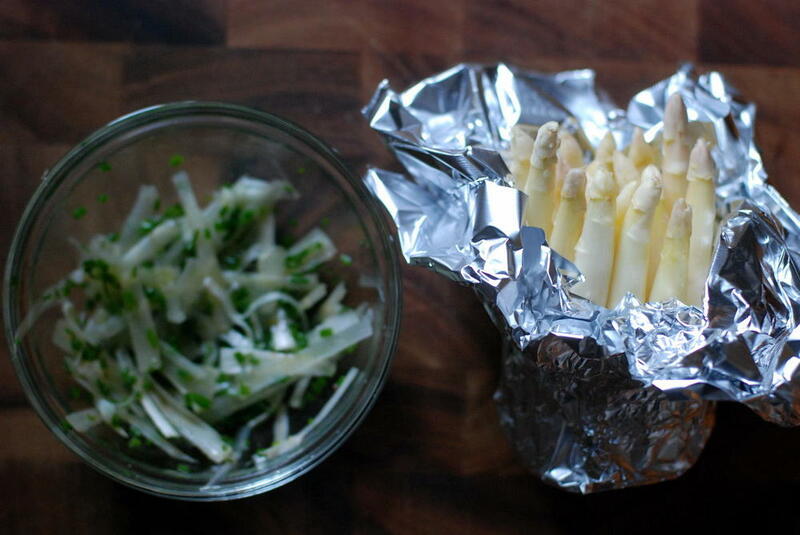 The original recipe has you bundle the white asparagus standing up, wrap them in a thick layer of tin foil, stick a pat of butter on the tips of the spears, and roast upright until (supposedly) they were just tender. But after 45 minutes under 400-degree heat, my asparagus were still extremely crunchy - not to mention insipid. Blame the asparagus? Perhaps. Regardless, not a promising sign. While the asparagus cook, you're meant to make a simple sauce of salted cashews and milk. The flavor is fantastic - sweet and mild, a perfect white-on-white pairing with the asparagus. But Sciolino's original recipe calls for cashew powder to be stirred into milk. This means you must grind cashews to a powder while taking great care to not let them turn into a paste. It also means that the final product, milk thickened with powdered cashews, has a somewhat chunky texture, where I'd much prefer a smooth, creamy sauce. Last but not least: the asparagus begged so desperately for salt that when I first made this, I actually sprinkled some flaky salt onto the finished dish. So much had gone wrong! I was almost ready to call the dish a dud. But then, so belatedly, my instincts kicked in. With my precious second batch of white asparagus, I did what I always do with the green ones: roasted them in salt and pepper. For the sauce, I borrowed a technique from a favorite Indian recipe, and soaked the cashews in the milk while the asparagus cooked. Then I immersion-blended the mixture until smooth, before heating briefly just to thicken it a bit. The result was a smoother, creamier sauce: success. The julienned topping required no changes, except that this lazy bum simply peeled some shavings instead of doing a proper julienne. That change, too, was a net improvement. So was this recipe a dud? Sort of. Should you make the version I'm sharing below? Absolutely. And do me a favor: if you find yourself at all near the forests of France during white asparagus season, go pick some, and try the original recipe again. I bet there's magic in there, somewhere. Combine the cashews, the milk, and 1/2 cup of water in a small saucepan. Let the cashews steep in the liquid while you prepare and roast the asparagus. Toss the asparagus tops with the remaining olive oil, sprinkle lightly with about 1 - 1 1/2 teaspoons of salt and a few grinds of pepper, and spread in a single layer on a baking sheet. Roast asparagus for 15-20 minutes, checking periodically for doneness, until asparagus are crisp-tender. If they're particularly thick or fibrous, they may need a few extra minutes, but try not to overcook them. When the asparagus are nearly done, use an immersion or regular blender to blend the cashews, milk, and water until completely (or near-completely) smooth. Then heat until the mixture just comes to a boil. Set aside. To serve, arrange a large spoonful of the cashew cream in the center of each plate; top with 4 asparagus tops; and finish with a spoonful of the shaved asparagus stems. Alternatively, serve the dish family-style: Spoon all the cashew cream into the center of a long serving plate, set the asparagus tops across the cream, and finish with a bit pile of the shaved stems. To gild the lily, you can pulverize a handful of salted cashews and sprinkle them over the finished dish. The crunch is nice, but not essential, especially if you're trying to minimize utensils and steps. That's some ginger monkey bread, or monkey gingerbread, or deliciousness. Because why not? Consider it your weekend project. A few links for this chilly Thursday. Enjoy! If you haven't yet read the truly astounding 5-part NYT series "Invisible Child," about 12-year-old Dasani and her life as a homeless girl in New York, go read it now. Then go to The Wednesday Chef, where awesome Luisa is auctioning off half (half!) of her very impressive cookbook collection to benefit the Invisible Child Fund at the Legal Aid Society in New York. The story will move you, the cookbook collection will thrill you, and if you feel moved enough -- or thrilled enough -- to bid on, say, a signed copy of Thomas Keller's Ad Hoc at Home, the Legal Aid Society will thank you. Did you see Jiro Dreams of Sushi? If so, surely you remember the scene where one of Jiro's apprentices tells of the time when, after years of attempting to make the famed tamago yaki, the custardy egg sushi that ends a meal at the restaurant, Jiro finally tells him that his custard is acceptable, and he cries of happiness. Well, now that very same apprentice has a restaurant in New York, and....you should read all about it. Molly has taken my favorite cabbage recipe, Marcella Hazan's Smothered Cabbage (from which I made risotto, back in 2010) and transformed it into soup. Soup that was made for the chilly nights we've been having here in DC. Added to my must-make list. White House holiday cookies, because yes. They even made Bo cookies! If I'm lucky, I'll see some of these goodies when I go see the WH all dressed up for Christmas later today. You may remember that I discovered a new favorite sourdough starter and bread method, from Tartine Bakery, earlier this year. Tartine's method is involved, but once you get the hang of it it's both straightforward and sufficiently flexible to find its place in your daily (or in my case weekly) routine. I love that Food52 is doing a whole series on bread making and baking with Chad Robertson, the proprietor of Tartine. Check it out. Lastly, Deb just posted my all-time favorite torte on her blog. You guys, you've gotta make Linzer. It's the best. Well, I'm definitely too late for Hanukkah, but hopefully I can catch those of you starting to do your Christmas shopping. 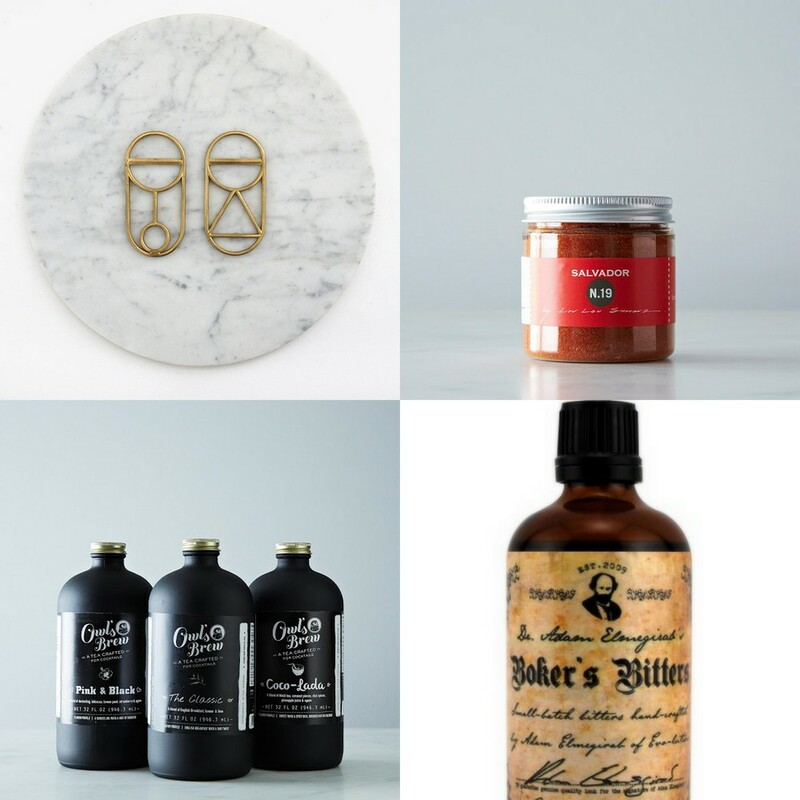 These are gifts for the food lover, the cook, the person who dreams include fancy cocktails and beautiful pie servers. As always, if you've got other suggestions, leave them in the comments. Happy gifting! Pok Pok Som: When I ate at Pok Pok Ny for the first time, we started our meal with an addictive tamarind cocktail made from this drinking vinegar. It's light, refreshing, and the perfect thing to take your mind off of the 20-degree weather outside. Tamarind is my favorite, but I also love the honey, ginger, and thai basil flavors. Liddabit Stout Gingerbread Caramels: Brooklyn Larder is one of my favorite spots in New York, and Liddabit makes some of the best caramels in the country. These seasonal confections are particularly tasty. Craft Coffee Subscription: For the friend who's both a coffee snob and extraordinarily busy, Craft Coffee is the perfect solution: regular shipments of just-roasted, small-batch coffee beans, dropped off at your door. Not much more expensive than buying the bags at a store. Falls Mill Grits: I first purchased these grits on a business trip to Nashville, and I so loved them that I've made a point to stock up every time I head down there for work. Really good flavor, not expensive, great for polenta or grits or even folding into bread. Crest bottle openers:for me, the pinnacle of elegance. These bottle openers have been making the rounds in foodblogland, and I've caught the bug. Practical enough to use, pretty enough to display. I love them all. Salvador spice blend from La Boîte à Epice: ABC Carpet & Home has a small selection of La Boîte à Epice spices, and best of all, they have a little tray of the spices available for tasting. Last time I visited, I dipped and smelled my way through a handful of blends, and each was so fresh and vibrant, as though they'd just been mixed. (Perhaps they had.) My favorite new shop, Food 52's Provisions, has a selection of these blends available. The one I'm most excited about is the Salvador, made of saffron, pimenton, and seafood essence. It's begging for paella. Owl's Brew Tea for Cocktails: The kind folks at Owl's Brew sent me some of these goodies to sample. The tea itself is quite good, but what really won me over is how easy and unstressful it makes cocktail mixing. Pour, add spirit of choice, sip. People will think you're so fancy, and you'll barely have lifted a finger. Available on Owl's Brew's website and on Provisions. Boker's Bitters:Got these as a gift from my brother and sister-in-law last year, and loved them immediately. Couldn't quite put my finger on the dominant flavor, but my friend Josh finally solved the mystery: we think it's cardamom. Whatever it is, it's a winner in manhattans and particularly friendly to stout-based cocktails, which we've been making a lot. Herringbone Napkins: I've taken to gifting linens when folks have us for the weekend. What's nicer than a little bundle of napkins or placemats, or even a nice runner for the table? These are especially charming. 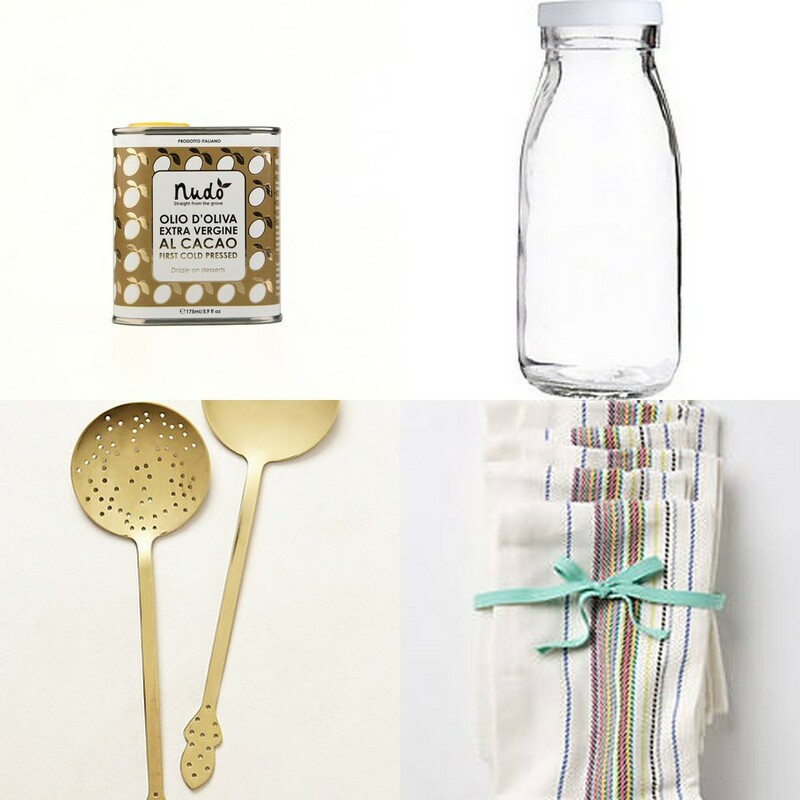 Pretty gold spoons from Anthro: What's a gift guide without a little Anthro bling? These vintage-inspired gold spoons are a current crush, the sort of thing I'd never buy for myself but most definitely would gift to someone. Vintage Milk Bottles: I bought these from Paper Source for our Thanksgiving tablescape. They came in a pack of 6, and I filled 4 with spare bouquets of flowers and berry stems, and tied a little ribbon of twine around the neck of each bottle. I just loved the way they looked. Come winter, I'll use them to serve cold cream with coffee, or warm maple syrup with pancakes. They've been such a surprisingly useful addition to my kitchen that I thought you might like some, too. Nudo Olive Oil: The kind folks at Nudo sent me some of their cocoa nib olive oil to try a few months back. It's a novelty item at best, more fun to taste with a spoon or serve over fleur de lait ice cream than use in actual cooking. That said, I went out and bought one of their regular olive oils to try, and it was clean and grassy and really quite lovely. GIVEAWAY: Nudo has offered to send one lucky NDP reader a Quattro Stagioni gift set, which contains 4 8-oz. canisters of plain, lemon, pepper, and basil-scented olive oils. They're good stuff. To enter, leave a comment below and make sure to include your email address (which is never ever published or sold) in the secure sign-up form so I can contact you if you win. Enter by midnight, December 8th, and I'll choose a winner on December 9th. Good luck! Jerusalem: Far and away my favorite cookbook of 2013 (and everyone else's, too.) Beautiful recipes with just the right dose of innovation - a dash of pomegranate syrup here, a bit of sumac there. The ingredients aren't so new to me, but many recipes call for combinations that never would have occurred to me. It's a grains and greens-focused book, with enough meat and fish to engage the omnivores. For me, pretty darn close to perfect. Four and Twenty Blackbirds:I'm not big on specialty cookbooks (with the exception of breadbooks), but this pie book is a stunner. If you haven't been to Four and Twenty Blackbirds, make a pilgrimage next time you find yourself in New York. They make fantastic pie. As for the cookbook, their butter crust is perfection, and their salty honey pie is absolutely the best pie I discovered this year, beating out fierce competition. Modernist Cuisine - the e-Book!If you considered buying Modernist Cuisine at Home but passed, you'll be thrilled to know it's now out on e-book. Unlike other e-books, which are just electronic versions of the paper thing, the MC folks put a ton of thought into how people would use an ipad publication differently from a paper edition. The result is so, so elegant. Even if this isn't on your shopping list or wish list, go watch the video promo on their site. The Zuni Cafe Cookbook:Not a new book, not by a long shot. It's a classic, and it occupies a sacred space on my shelf for its careful treatment of beautiful ingredients and for its indispensable, inspiring section of spreads, sauces, pickles, and preserves. Judy Rogers, its author and the cook at the helm of the Zuni Cafe, passed away this week from cancer at age 57. I've been thinking about her recipes and about how much I've learned from her patient, deliberate approach to cooking good food. If you don't have her book, you need it.